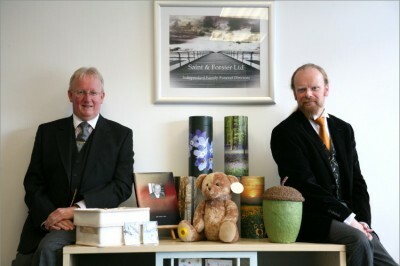 Saint and Forster Funeral Directors Ltd are funeral directors in Darlington. At Saint and Forster we believe that as every person is unique so every funeral should be unique. There is no ‘right’ way to hold a modern funeral. When you come to us we will take all the time that is needed to get to know you and to listen to what you say. We will work with you to design a funeral that celebrates the achievements, beliefs and personality of your loved one rather than simply offering you a choice of pre-set packages. We put you firmly in control and we will give you the funeral that you want. We take time to answer all your questions and concerns and our advice is always free. Saint and Forster was established in 2009 by successful photographer Malcolm Singleton and his wife, Sarah. Malcolm wanted to move away from the traditional sombre image of the funeral home and so created a light and airy environment where families can feel comfortable and relaxed while they discuss their needs. In 2011 Malcolm was joined as a partner and co-owner by experienced funeral director Keith Munt. Malcolm and Keith are passionate about their vision of providing excellent and personal funeral care at reasonable and ethical prices. We are proud to be recommended by the Society of Bereavement Practitioners and the Good Funeral Guide. Serving Darlington and the surrounding area, we provide a personal and caring service 24 hours a day, 365 days a year. We are available to discuss anything that is worrying you, or even if you just need to hear a friendly voice. We hope that you will treat our premises as an extension of your home while we are looking after you and your loved one. Our website is designed to be simple to use and to give you all the information that you might want. Please feel free to visit our website or give us a call and speak to Keith or Malcolm. We will work with you to tailor make a funeral that celebrates the life of your loved one in the way that means the most to you, however simple, elaborate or traditional that might be.